I was recently talking with some wealthy parents and I was struck by how they are able to lavish private preschool education on their children that cost more than the $30,000 tuition at private colleges like Bluffton University and then add expensive enrichment activities like ice skating lessons and music lessons on top of that. The inequality of educational opportunity in America is making our ‘meritocracy‘ less about merit and more about the privileges of being born into wealth. The US is becoming more like the private educational system of two centuries ago when the elites hired private tutors like Adam Smith to teach their children while everyone else remained illiterate. Asia has found a way to democratize this sort of private education by creating relatively inexpensive cram schools for the masses that teach groups of children after school. In these societies the meritocratic ethos has trickled down to middle-income families who emulate the elites in paying for private tutors, and they have achieved economies of scale whereby large groups of kids attend private cram schools together. Many Asian countries also have gender inequality which makes women’s wages cheap. Asian women can become teachers and are de-facto excluded from most other occupations. This cheap labor poor makes education cheap. But richer families hire high-quality private tutors whereas middle-class families send their kids to crowded cram schools. When I lived in Taiwan, I was a private English tutor for rich kids and taught in elite cram schools. One pair of kids required a Chinese tutor to help manage their unruly behavior while I tried to teach English. The boy frequently made visceral screams in protest against his studies. If he had been in a middle-class cram school he would have been kicked out, but after a year of patient guidance and tutoring, he became a decent student and stopped writhing and moaning. Inequality will always be crucial in determining the distribution of services because the cost of services goes up with the cost of labor. Manufacturing has democratized the distribution of consumer goods. Almost everyone can afford pens and paper and books today whereas a book used to cost as much as a small farm before Gutenberg. But education will always be out of reach for many families with children. 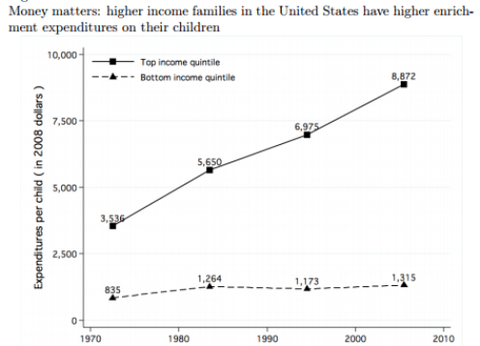 in 2011 (latest data available), the median income for a US household with children was $57,240 and the median income for a single-parent household with children was about half that. The average number of children per family is about 2 and poorer families tend to have more children in the US. The average family will need to spend the average amount on primary and secondary school tuition (10,694 each in 2009) for two kids which is $21,388 for 12 years. For single-parent families, that is most of their income, but even for the median American family, it is 37% of their income and it would push them down to only 50% above the poverty line. Forget about saving for college which cost an average of $22,092 per year (including room and board) in 2011. 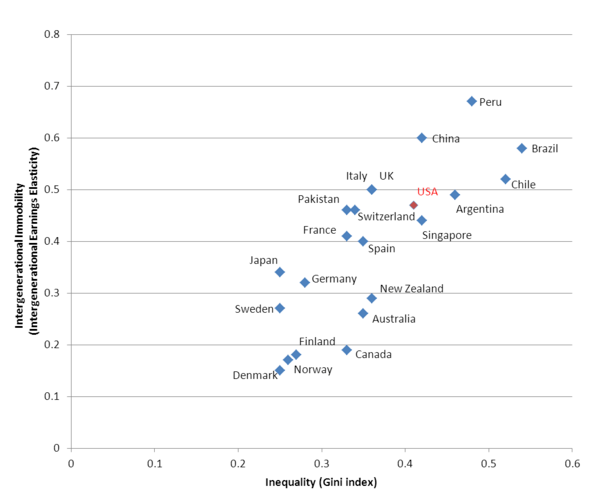 One of the reasons that college is so much much more expensive in the US than in other countries is our high inequality. The average college student comes from a much richer family than the average family and so colleges have the incentive to target the average dollar (businesses have incentives to be mutilitarian) in determining their pricing structure and amenities. Higher inequality makes colleges seek a richer average customer with higher average willingness-to-pay and produce a product that appeals to more luxurious tastes. Education will never be affordable for everyone as long as it is a service that is produced by other people and even the median American will always find that it is a struggle to afford it. That is an important reason why the median American cannot get a college degree. Miles Corak (via Krugman) recently found that inequality in educational enrichment is increasing in American. The wealthiest 20% is spending much more than than it did three decades ago, but the bottom 20% has not seen much gains. This is because higher inequality makes educational enrichment more expensive for the bottom and suppresses their expenditures because inequality raises the average cost of services. Inequality lowers the relative cost of services for the elites (servants are coming back into vogue among elites today), but raises the relative cost of services for the median and for people at the bottom. American elites today have figured out how to manufacture human capital in their children. This is a much better use of their money than the $10 million David Brooks spent on his daughters’ 13th birthday party, but it means that meritocracy today is more about inherited wealth than it is about inherent merit and character. The slave societies of yesteryear were meritocratic too in that their elites really had greater skills and ability (merit) than their slaves, but that was simply because the slaves were barred from attaining the kind of ‘merit’ that would give them the ability to perform higher-paying jobs. Meritocracy is always going to be partly about what kids inherit, but proponents of meritocracy should think more about how to increase equality of opportunity. That is going to require reducing inequality in America because of the Great Gatsby Curve. There is a high correlation between equality now and the opportunities of children for their future (inter-generational mobility) because of the ability to manufacture opportunities for children.